Today is national "Talk Like a Pirate Day", and friends of ours invited us to help them celebrate the day with their family -- including their two seventh graders. I made some Haitian Red Beans and Rice, but being an artist, I thought it would be fun to create and bring an artistic object to mark the day. 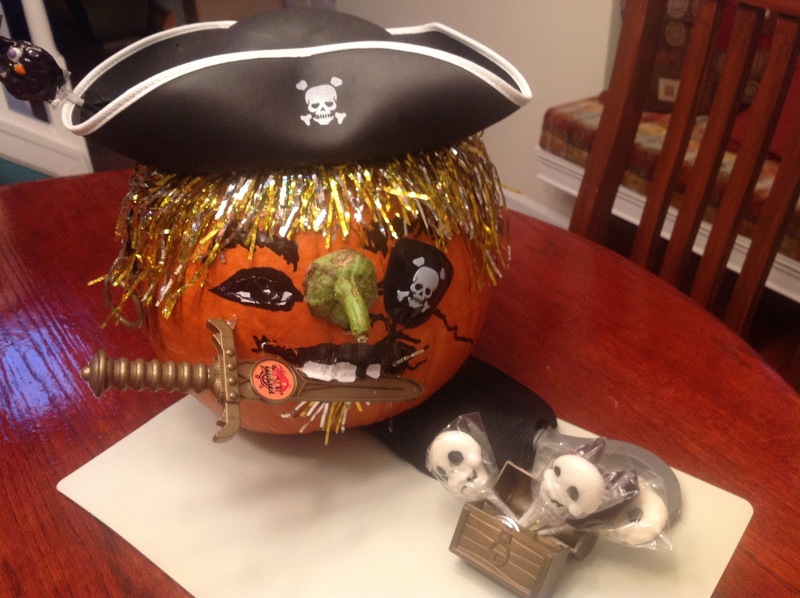 Being practical, I also thought if I made it out of a pumpkin, and didn't pierce the shell, it would have a better chance of serving a double purpose for them: Halloween as well as "Talk Like a Pirate Day." If you want to make your own pumpkin character soon for Halloween, here are some items that helped me inexpensively create my own buccaneer. I shopped at the Dollar Store to cut down on expenses. The hat, the earring, and patch were packaged together. 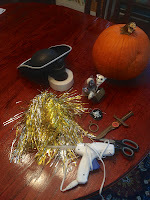 The tinsel wig cost $1, too, and I was able to cut it to make room for the face. The round guy's pirate knife, little chest, and dubloons cost another dollar. Along with a black magic marker, I used black and white duct tape to make the eyes and ears (to hold the pirate's earring), and teeth, and to use some of the left over tinsel to give my pirate a snappy little beard. Finally, I used hot glue to keep the "hair"', the knife, the hat, and the nose in place. One of the most fun things is the nose. It is the top of an eggplant I had that was getting a little past its sell-by date. If you make your own character, I'd love to see it. I got myself a show -- eek!